I was asked yesterday by ‘a correspondent with UN/IRIN News’ to respond to a IRIN report of an Amnesty statement which the correspondent thought needed ‘balance’. I was most grateful since IRIN had often published very biased pieces, without reference to OCHA in Sri Lanka. Though IRIN is dependent on OCHA and is cited as a UN agency, it makes much of its independence and sometimes ignores OCHA officials on the ground in its zeal. I should note that the Head of OCHA in Sri Lanka, Zola Dowell, seems to have done her best to ensure that she was consulted and that news was not skewed but, as she confessed, she did not always succeed. I am grateful therefore to this correspondent for having registered the need to at least consider another point of view. For reasons I can understand, given the way IRIN functions, he did not include my comments on Mr Zarifi, but I thought they should appear somewhere, since it is ridiculous that depressingly partisan persons should masquerade as independent. Given below is my initial response, followed by a couple of further questions from IRIN and my answers. The full IRIN article, the second on this latest Zarifi effusion, is appended. “Thanks, very simply I am surprised that IRIN quotes Zarifi who spent much of last year trying to criticize government efforts to deal with the Tigers. He evidently has not noticed that the Emergency Regulations have been relaxed. Generalizations about state forces without details that can be checked are typical of the approach to Sri Lanka that Zarifi learnt at Human Rights Watch, which made sensational allegations in releases that its own reports contradicted. They failed to respond to letters and in general have developed a culture of impunity that it is difficult for small states to overcome. IRIN: What is the need for the existence of emergency laws when the war against LTTE is already over? 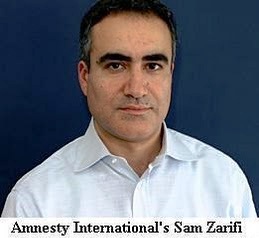 IRIN: Are there any truth in Amnesty claims regarding extralegal methods dealing with terror suspects and dissents? RW: Not as far as I know, since the Emergency allows for detention though now for more limited times. However, we are aware that torture and other violations do occur because of individuals, which is why we are trying to improve H R training for the police, as was done consistently with the army. This must be distinguished from our efforts against terrorism, as you will realize when you look at the cases last year, which regrettably were not noticed by Zarifi etc. That is why I suspect they have a political agenda.